, protestant minister of Leyden, and professor in the Walloon college of that city, a man of great abilities, and uncommonly versed in the oriental languages, was born April 7, 1590, at Flushing, where his father Daniel de Dieu was minister. Daniel was a man of great merit, and a native of Brussels, where he had been a minister twenty: two years. He removed from thence in 1585, to serve the church at Flushing, after the duke of Parma had taken Brussels. He understood Greek and the oriental languages, and could preach with the applause of his auditors in German, Italian, French, and English. The churches of the Netherlands sent him, in 1588, over to queen Elizabeth, to inform her of the designs of the duke of Parma, who secretly made her proposals of peace, while the king of Spain was equipping a formidable fleet against England. 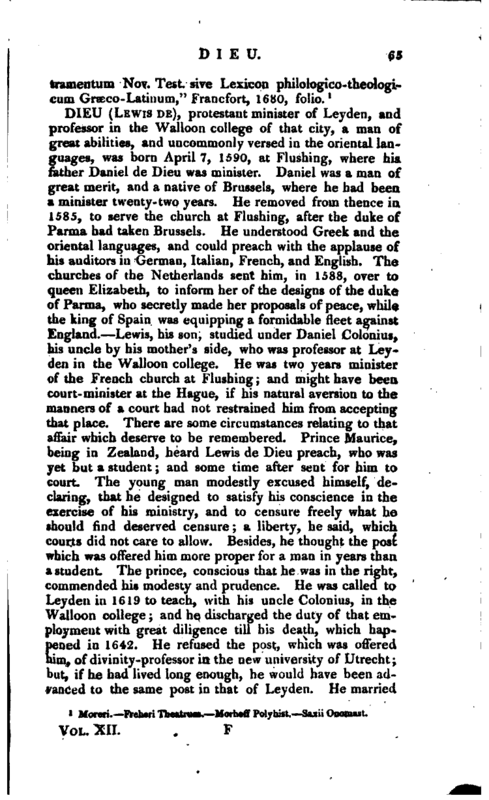 Lewis, his son, studied under Daniel Colonius, his uncle by his mother’s side, who was professor at Leyden in the Walloon college. He was two years minister of the French church at Flushing; and might have been court-minister at the Hague, if his natural aversion to the manners of a court had not restrained him from accepting that place. There are some circumstances relating to that affair which deserve to be remembered. Prince Maurice, being in Zealand, heard Lewis de Dieu preach, who was yet but a student; and some time after sent for him to court. The young man modestly excused himself, declaring, that he designed to satisfy his conscience in the exercise of his ministry, and to censure freely what he should find deserved censure; a liberty, he said, which courts did not care to allow. Besides, he thought the post which was offered him more proper for a man in years than a student. The prince, conscious that he was in the right, commended his modesty and prudence. He was called to Leyden in 1619 to teach, with his uncle Colonius, in the Walloon college; and he discharged the duty of that employment with great diligence till his death, which happened in 1642. He refused the post, which was offered him, of divinity-professor in the new university of Utrecht; but, if he had lived long enough, he would have been advanced to the same post in that of Leyden. He married | the daughter of a counsellor of Flushing, by whom he had eleven children. 1 Gen. Dict. —Niceron, vol. XV. —Foppen Bibl. Belg.—Moreri. Blount’s Censura. 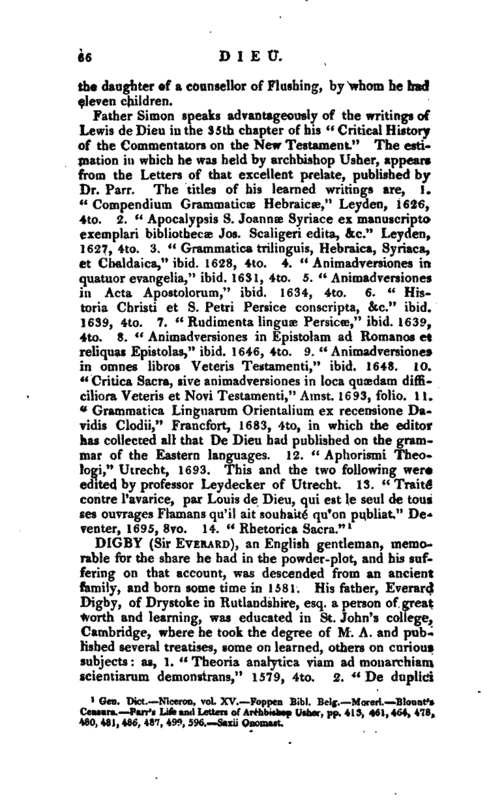 Parr’s Life and Letters of Archbishop Usher, pp. 413, 461,464, 415, 480, 481, 486, 4S7, 490, 596. Saxij Onomast.